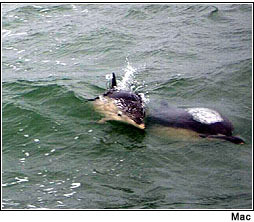 1st Mar 2004 Upwards of 50 common dolphins have spent the last three weeks in the Waterford Estuary, close to the Ballyhack/Passage East car ferry. They have remained in this area and have ventured further inland, on occasions going upriver as far as Cheekpoint. 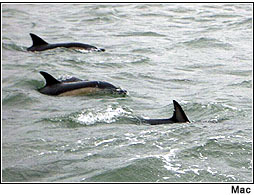 This wonderful event was captured on film by RTE and local photographers on February 26th 2004, and I was fortunate enough to observe them myself from the MV The Wild Swan', skippered by Jim Foley who has never encountered dolphin activity like this in his forty years fishing and working this area. The school included at least six calves who synchronised their dives in perfect harmony with their mothers. One juvenile indulged in a pirouette and some of the brasher sub-adults treated us to bouts of fluke-slapping behaviour. The dolphins remained with us for three hours and even when they headed out for deeper water off Duncannon, they were still frolicking in close proximity to our boat until we tailed off back to port. The big question is why are these dolphins staying in the area for so long? This activity is against the backdrop of many reports of fin whales in the Hook Head area since Christmas, so maybe there is an abundance of food in the area that these predators are keen to exploit. If you are planning a trip from Wexford to the west, why not go via Ballyhack and you might strike it lucky and see these amazing cetaceans from the deck of the car ferry.